Mecklenburg County building permit reports indicate that the structural frame of Legacy Union’s second phase in downtown Charlotte has a $28,599,000 construction cost. The permit for the 411,618 sq. ft. building at 650 S. Tryon was issued to Gilbane Building Co. on Jan. 8. Lincoln Harris had earlier announced that it would be developing an 18-story glass and steel tower on the site. 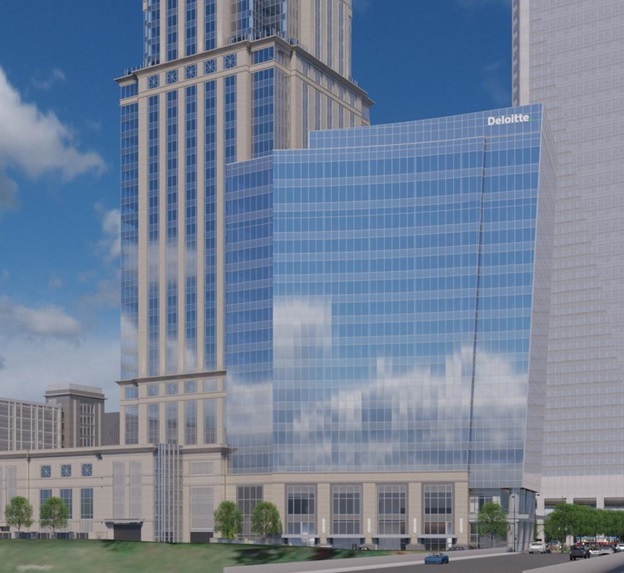 It will complement the 33-story Bank of America Tower, which is nearing completion on the 10-acre Legacy Union site located on uptown’s southern perimeter with easy access to Interstate 277. Legacy Union, bordered by South Tryon, Stonewall, Mint and Hill streets, will offer a mix of Class-A office space, retail, residential and hospitality space as well as a large pedestrian plaza and green space. LS3P is the project’s architect.